This soup has an irresistible quality, the flavors are deep and earthy with some sweetness from the potatoes. Don’t let the number of ingredients intimidate you – they build layers of flavor, but this soup is not at all difficult to make! In a large pot over medium-high heat, add watercoconut oil, onions, red pepper paste, sun-dried tomatoes red and green peppers, salt and pepper, cumin seeds, oregano, allspice, and red pepper flakes. Let cook for 5-7 minutes until onions and peppers start to soften. Add garlic. Cover, reduce heat to medium, and let cook another few minutes to soften garlic – if sticking/burning, add another splash of water. After a few minutes of cooking, add black beans 3 1/2 cups beans (reserving one cup of beans), water, tomato paste, vinegar, lime juice, and maple syrup (start with 1/2 tsp). Using an immersion blender, puree soup until fairly smooth. Increase heat to bring to boil, add bay leaf and diced sweet potatoes, then once at boil reduce and let simmer for 20-30 minutes. Add remaining cup of black beans and extra maple syrup if desired (taste test). Stir through, let simmer for another few minutes, then serve, topping with cilantro if desired and with lime wedges. Also delicious to top soup with some chopped seasoned avocado or a simple guacamole. Serves 4-5 as main course. Sweet Potato Tip: Sometimes I have leftover sweet potato home fries that have been seasoned with just sea salt. If so, I take a recipe and chopping shortcut and simply add these to my soup during the last 5-10 minutes of cooking, just to heat through. I’m a huge Dreena fan! The most recent recipe I made of hers was the gorgeous Festive Chickpea Tart from Let Them Eat Vegan. I do actually already have the PP15 e-book and although I haven’t got around to making many of the recipes yet I have tried this one. Perfect. “Let Them Eat Vegan” is my favorite of Dreena’s cookbooks–I love the “Tempeh Tickle” recipe in it. I’m a huge fan of Dreena Burton. I have all her cookbook except the one that you’re giving away Yeah !!! I like and enjoy lots of her recipe, but I would say that lately we enjoy her kale salad in her Let Them Eat Vegan cookbook. Thanks for sharing the recipe and the giveaway 🙂 It is really appreaciated. I would like to make Green Goddess Dressing. The Thai Pizza or the chimichangas from LTEV! Love all the recipes. Wait! They are from ED&BV! I love “Let them eat Vegan” and would like to try a few more of Dreena’s recipes. Dreena is awesome! Let Them Eat Vegan is on my Amazon wish list for Christmas! Her white bean rosemary soup rocks. I’ve got to try the Peanut Butter Munchie Squares!! The recipes in Dreena’s book look great! My kids would want to try the breakfast bars first; the Mac-nificent would be my first choice. Thanks for the giveaway! Her Super-Charge Me Cookies look amazing, I’m gonna have to try making some soon! Working from home is great for photographing food – I always remember reading with astonishment in my early blogging days about someone going home in their lunch hour to photograph food for their blog. I have only one dreena cookbook and love it but really need to use it more – her healthy rice krispie treats are probably my most recent recipe from her and I loved them. I really like Dreena too, she’s always giving me inspiration! One recipe i really love is her baked cauliflower 😃 delicious! I like the contrast between your and rob photography styles- I think mine is a funny combination of the 2. 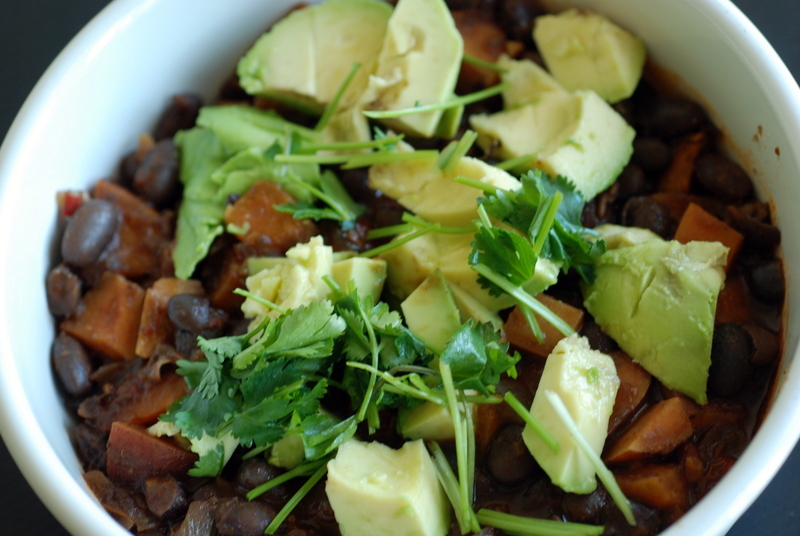 I love the sound of this stew, and the chunks of avocado on top look wonderful. I totally get the struggle to take blogworthy photos of your dinner, once the days start to get shorter. Thankfully I’m enjoying the opposite in my part of the world right now, with long twilights that make taking a few food photographs at the end of the day so much easier. The Living Caesar Salad Dressing from Eat Drink & Be Vegan is SO good!!! Those pumpkin seed chocolate chip oatmeal bars fo sho. I know what you mean about losing light early – it really messes up my picture taking for the food blog. Ah well. I would like to try the Umami Sun-Dried Tomato and Almond Burgers. Yes! I have lots of giveaways for the next few weeks (youpee!!!). The coconut pillows look awesome. We should totally try to make them together. I’d like to try the Mac-nificent! I don’t have any of her cookbooks, yet! 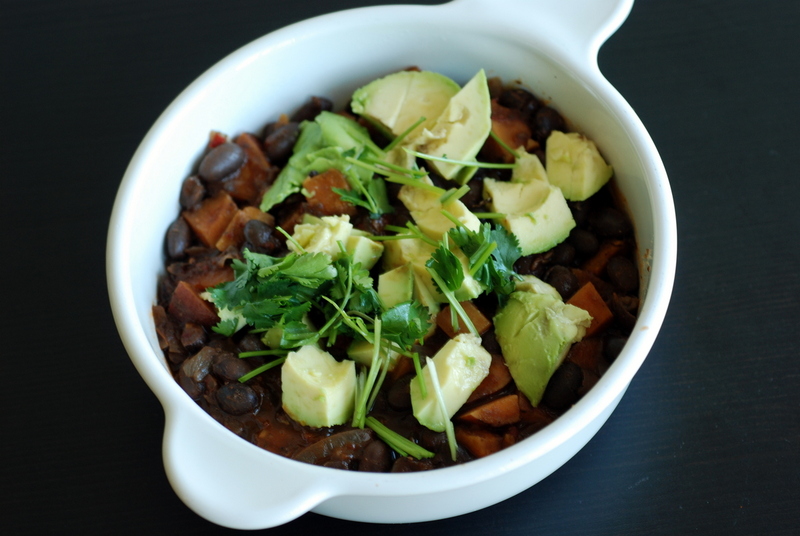 I’ve not tried any of Dreena’s recipes ,but the black bean sweat potato is a must try. The No Fu Love Loaf is one of my favorite lentil loaves! 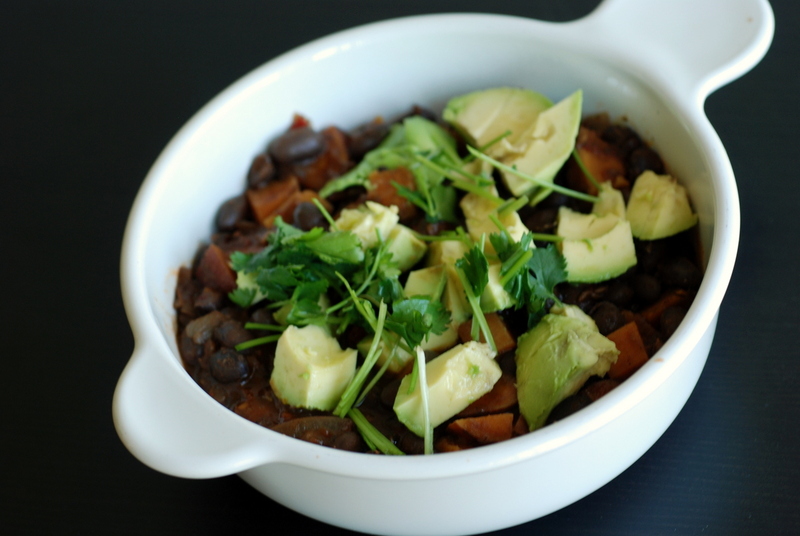 This black bean dish also looks amazing! I’m always on the lookout for a good mac and “cheese” recipe, so the Mac-nificent is probably where I would go first. What a tasty and healthy stew! What a shame that I’ve missed the giveaway 😦 I’ve been offline for a week lately… anyway congratulations to the winner and have a great weekend! I want to try her almond zen granola! Thai pizza has always been a fave of mine – thanks! We love Dreena’s burgers and also ‘cheesy sprinkle’ – would love to win the plant powered 15! I like her jerk chickpeas the best, but have made a few of her other recipes. I’m not oil-free, but I use it in moderation at home. Would love to win the PP15! I love that she has a whole Hummus/Dip chapter in LTEV. I would love to try any of those! 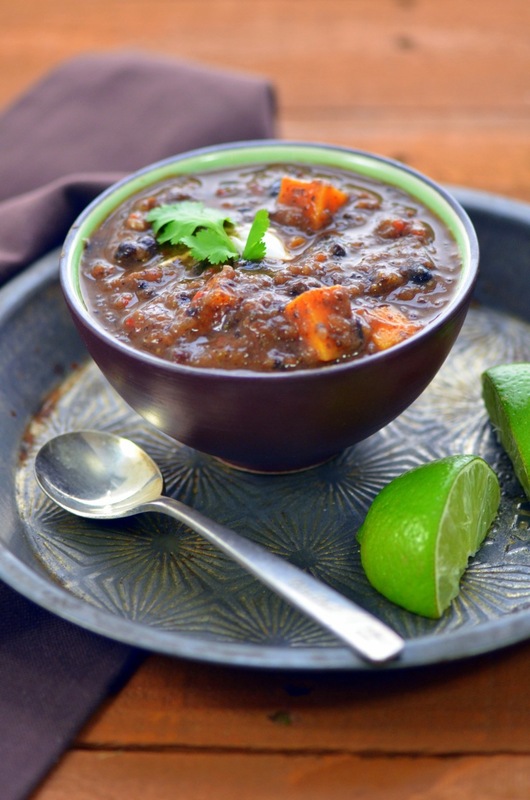 Love the black bean sweet potato stew, the bowl looks perfect for this winter weather! Thanks for the submission towards MLLA and also introducing me to Dreena’s Plant Powered 15. The “Pumpkin Seed and Chocolate Chip Oatmeal Breakfast Bars” sound wonderful. Would love to make them for breakfast. I was thinking of making it, but I’m a bit unsure, this is an unusual mix of spices (cumin, oregano, allspice). Any comment? This looks super warming for our colder months here in the UK. Thank you for joining in the No Waste Food Challange.